Walmart is leading American renewal through its commitment to purchase an additional $250 billion in products made, sourced or grown in the U.S. by 2023. By investing in products that support American jobs, Walmart can play a role in accelerating growth in U.S. manufacturing. By collaborating with suppliers, engaging industry experts, and leveraging our scale, Walmart’s commitment could create up to 1 million new American jobs*. To underscore Walmart’s commitment, we are hosting our 5th Open Call for new U.S.-made products. This unique event is open to both current and potential US suppliers and will be hosted at our corporate offices on June 13, 2018 in Bentonville, Arkansas. Buyers will be on hand to meet one-on-one with selected companies during our “Open Call”. The replay of last year’s general session event is available here. 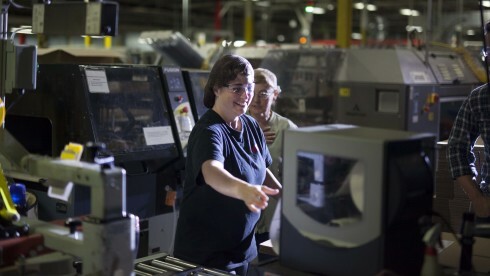 In towns across America, manufacturing is creating jobs – and making our country stronger. Read about companies making a difference. In addition to the $250 Billion investment, the Walmart U.S. Manufacturing Innovation Fund is committed to awarding grants for manufacturing research.